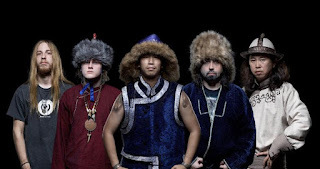 Global Music Award-winning Mongolian folk metal group TENGGER CAVALRY recently announced their upcoming North American fall headline tour dates, featuring heavy metal frontrunners INCITE as special guests. The tour will kick off on September 16th in White Hall, MD, coming to a close in Revere, MA on October 15th. In celebration of next week's tour kick-off, the band has teamed up with Decibel Magazine to share a mini tour documentary created after their last U.S. run. The documentary was directed by Uljmuren, TENGGER CAVALRY's Morin Khuur player, who has an extensive television background in his native China. You can visit Uljmuren's studio online at www.nymbat.com. In addition to the mini tour documentary, Decibel is also hosting an exclusive series of photos taken by frontman Nature Ganganbaigal during his recent pilgrimage to Mongolia. Nature details each moment captured with personal descriptions. View the tour documentary and Mongolian photo gallery HERE. Nature states, "TENGGER CAVALRY's musical soul is rooted in nomadic culture. Without nomadic life, nomadic music can't exist, and that's why I decided to go back to Mongolia. Spending time with nomads, horses, sheep and cows offered a realistic experience, putting me deep in touch with those traditional roots. It's important for me to remember what it feels like to ride horses across the boundless grassland, for example, and to translate that experience into our music, making it as authentic as possible. It's not possible to be fully influenced just from studying cultures in books, films or other media. We need to immerse ourselves in the traditions of the homeland." TENGGER CAVALRY's most recent release, the Mountain Side EP, can be ordered here. Mountain Side EP features re-orchestrated versions of popular tracks, as well as completely new music accented by acoustic, instrumental and remix versions. The EP also features bonus live tracks and folk recordings. In particular, the re-recording of the band's already popular track "War Horse" still features the traditional Mongolian throat-singing that TENGGER CAVALRY is known for, but has now been completely re-composed and re-recorded to include influences such as Mongolian traditional folk, Native American tribal music, and cinematic film landscapes. TENGGER CAVALRY was recently awarded a Bronze Medal for the EP title track "Mountain Side" as part of the Global Music Awards. A fully acoustic version of their most recent full-length release, Blood Sacrifice Shaman, is also available now. Download via Bandcamp here. Make sure to also check out the band's official guitar tab book, featuring guitar tabs of band's most popular songs such as "War Horse", "Horseman" and "Hymn of the Earth". Get your copy now via Amazon, or download digitally via iTunes.